Dance2Dream Residences - Pieces of a Dream, Inc. Pieces of a Dream, Inc. is extremely proud of our two in-school dance programs: dance residencies and the "Riot-Us Behavior" story-telling workshops. Workshops are available for grades kindergarten through 12th, and are also appropriate at the collegiate level. Whether you are interested in having Pieces of a Dream, Inc. conduct weekly dance lessons, lead a story-telling lesson, host a one-day workshop, or perform a dance concert, contact us to discuss your options today! 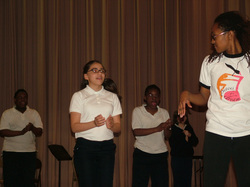 Pieces of a Dream, Inc. offers the opportunity for schools to enroll in our in-school dance residency program. Each residency is custom-designed to meet the needs of the individual schools and their student population. Typically, residencies are held once a week, either during the school day or during after-school activities. An instructor from Pieces of a Dream Dance Theatre leads the students through a typical dance lesson in the style of their choice. During the course of the residency, the students, many of whom have never had formal dance training, discover an opportunity for positive self-expression, develop their creativity, and gain from the structure of a dance program. The instructor can also teach the students a dance, which can then be performed during school assemblies, spring concerts, or any school activity. For more information, or to schdule a residency for your school or community group, CONTACT US! "Riot-Us Behavior” is an original choreographic work about the riots that erupted after Dr. Martin Luther King was assassinated in 1968. Pieces of a Dream, Inc. is committed to present Riot-Us Behavior to as many students as possible through the story-telling workshop series. Within the Riot-Us Behavior project, Pieces of a Dream, Inc. dancers go to schools to lead the students through workshops, incorporating storytelling through movement. These workshops serve several purposes: increase the students' activity level in a society where young people are increasingly obese at a younger age; introduce students to the world of dance, thus sparking the desire to study and perform dance in some and encouraging patronage of this art form in others; introduce students to the use of storytelling through movement and allow them to create and perform their own movement-based stories; provide supplementary education to students about the assassination of Dr. King, the riots that followed the assassination, the National Guard occupation of Wilmington, and the sociopolitical background of our state and our country; and encourage the students to research other historical topics on a local, national, or global scale. Upon the conclusion of the three-day workshop, Pieces of a Dream, Inc. dancers perform Riot-Us Behavior and answer the students’ questions. Pieces of a Dream, Inc. in conjunction with scholars of the era, has created a study guide to accompany the viewing of Riot-Us Behavior. Each student and teacher receives the study guide, which includes timelines, maps, and information about important groups and individuals, like Gov. Terry, SNCC, and the National Guard. If you are interested in scheduling a Riot-Us Behavior Story-Telling Workshop for your school or community organization, please contact us!